happier at home… | maya c.
Whenever I find myself in a bit of a life pickle, I always seem to end up in the one place I know I will find answers: the bookstore. Somewhere in those millions of words, I know someone will have written something I need to read. So I wander amidst the shelves gently touching covers, reading sleeves, and leafing through pages. Without over thinking it, I try to let the book find me. And somehow, usually, it does. Today I took my somewhat weary heart to my favourite bookstore, the Runnymede Chapters. There’s something about that place that I just love. Perhaps it’s the fact that I can still fondly remember my very first date at what was then the Runnymede Theatre. He took me to see Titanic. I was 14. It was lovely. But back to today… I wandered around Chapters killing time, pondering, and then I saw it. 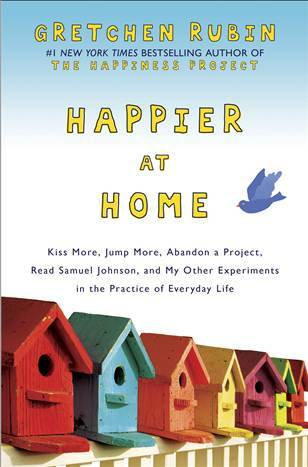 “Happier at Home” by Gretchen Rubin. And there it is, exactly what I’ve been wondering for a very long time. I feel the blogging itch coming back! That’s it for now… I’ve got pages and pages to read! < Previous best croissant in TO!